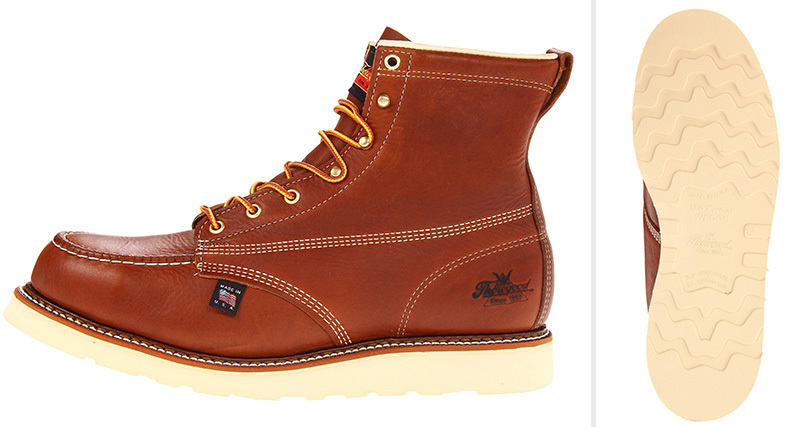 Wedge Sole vs Heel Work Boots - Which is better? If you are on the hunt for the best pair of work boots you will see that most work boots outsoles come in two varieties: wedge sole and with a regular heel. In this wedge sole vs heel work boots comparison we are going to take a closer look at each sole and explore the differences. A wedge sole is usually made of one single piece of rubber that tapers down from the heel to the toe to form it’s “wedge” shape. Unlike a heel sole boot, the shape of the wedge allows for the entire outsole to touch the ground. A wedge sole is usually made out of polyurethane which is great for hardwearing soles because of it’s heat, oil and slip resistance. Many work boot brands have their own proprietary wedge soles with their own unique safety features. The most popular kind of wedge sole is the Christy sole which is a type of wedge sole made exclusively by Vibram. The Vibram Christy can be found in many different brands such as Danner and White’s work boots. Heel work boots are what you'll normally see on job sites and in casual wear. A work boot with a heel sole can be made of a variety of materials such as leather, rubber, cork, or even wood. To learn more about different kinds of boot soles make sure to check out our helpful boot sole guide. An importance difference between a wedge sole and heel work boot is that a heel sole doesn’t sit flat on the ground. The front of the outsole tapers into the foot and a heel “stack” creates the lift on the back of the foot. Another difference is that heeled work boots offer more lugging options for traction and grip. Wedge soled boots often only have very light treads. What you’ll most likely notice when shopping for work boots is that most work boot brands offer similar styles in both wedge sole and regular heel sole versions. Common features such as anti-slip sole material, safety toes and upper designs can be found in both wedge and heel varieties. This leads us to the heart of the discussion: What’s the difference between wedge sole and heel work boots? The answer lies in the kind of work you do which we will explore below. Wedge sole boots are best for work environments where a heel might catch on something and cause a tripping hazard. A good example is a profession like ironworking where wedge sole work boots make it easier to climb and walk on steel without a heel to catch on rivets. Any environment where tripping causes a serious safety hazard will benefit from the lack of heel on their work boot. Lugged soles are great for traction but can wreak havoc on a job site where there is a lot of dirt and debris. Instead of deep lugs, wedge outsoles feature shallow treads that make it easy to avoid debris from getting stuck to the bottom of your work boots. A great real world example is with asphalt pavers who want to avoid hot asphalt from getting stuck to the bottom of their boots. The shallow pattern on a wedge sole makes them easy to clean and safer to walk on. Those who work long hours on the feet will benefit from a wedge sole boot. Since the entire outsole touches the ground it allows you to reduce pressure points while standing for long periods. Those who work on hard surfaces such as concrete will benefit from the extra cushion provided by a wedge sole. Another comfort feature to consider is that wedge soled boots are often more lightweight than their heel sole counterparts thanks to the single piece of lightweight material used in the wedge. The biggest con of wearing a wedge sole boot is that they wear down pretty quickly. Wedge soles won’t last as long as a regular heel sole made of tougher materials. In fact, the sole will often go sooner than the uppers. This means you’ll have to resole a wedge sole work boot more often and if you didn’t purchase a repairable work boot, you’ll have to replace your boots altogether. Another wedge sole boot con is that they don’t provide the best traction. Those who do a lot of climbing, work outdoors or in harsher environments may find the grip and traction on wedge sole boots to be lacking. Work boots with heels are great for anyone who needs the grip, traction and toughness that a wedge sole boot doesn’t provide. Heel sole boots are best for those in logging, electrical work, linework and construction. With heeled work boots you’ll have more variety when it comes to the height of the heel, depth of the lugs and materials used in the outsole. Loggers and those who work outdoors will need heavy lugs to provide the most traction. Lineworkers and those who work in construction will benefit from the ability to do their daily tasks safely. This is because work boot with heels allow you to “lock” your feet when climbing ladders, walking steep inclines, or working a shovel allowing for better grip and a safer work environment. Ultimately the wedge sole vs heel work boots debate comes down to job safety and personal preference. In many professions a wedge sole work boot is not only more comfortable but much safer. For those who need the traction however, a heel work boot will be the safer option. The best thing to do is to take a look at your profession, work environment and any company safety requirements before making you next work boot purchasing decision. Timberland vs Timberland Pro - What’s the difference?